To protect human security in rural Bangladesh, people-centred development is the core of discourse as this approach appeared in the cutting edge of international development discourse focusing on self-belief, self-reliance, and community living with the spirit of togetherness, social justice, and participatory decision-making. Unfortunately, it is missing in the context of rural Bangladesh as top-down approach dents the credibility of local authorities in safeguarding human security for the sake of community. The author converses the effects of human security in the rural development approach and where complications appear. Human Security, a non-traditional security approach, generally refers to the survival of individuals, community and even the global world. Without doubt, human security has been the emerging paradigm for understanding global vulnerabilities whose proponents challenge the traditional notion of national security by arguing that the proper referent for security should be the individual rather than the state. It is apparent that long experiences of rural community development in Bangladesh led to not only socio-economic improvement, but had implications for social, economic and environmental systems. Rural development in Bangladesh is found to be less progressive as most community based organisations are reported to be inactive. Besides, a lack of sense of belonging to development programmes, increasing community dependency on outsiders' help and the absence of community perceived development have contributed to the underdevelopment, resulting in human insecurity in rural Bangladesh. The population of rural Bangladesh faces critical issues of social, economic and environmental sustainability such as a significant decrease in water supply caused by significant loss of water resources (springs), recurrent natural disasters and probable impact of climate change. These issues lead to significant threats to agricultural and community livelihood. Political security of the rural community is truly reflected only when they have access to the decision making process of local government with freedom of choice for the selection of their representatives to the Union Parishad. Local government of Bangladesh gives rural people opportunities to taste freedom and participation. In 2015, there was a paradigm shift in the local government system when the Cabinet decided to hold local polls on a partisan basis. By changing the century-old practice of non-party poll at the local body level to the first-ever partisan poll, there are new challenges for political parties of Bangladesh. There are two schools of thoughts on this issue. According to the conservative school of thought, though it is a little too early to settle on the party-based electoral system of Union Parishads, the development around the ongoing Union Parishad elections is sending a wrong message. The volume of violence, the complaints related to nominations as well as corruption in the electoral system has been terrible. As the Union Parishad elections were held on a non-partisan basis in the past, many neutral and locally-popular people had the opportunities to be elected. This time, however, such people did not come forward in many cases. Moreover, corruption in the nomination process has turned out to be a real shame. Dedicated and honest politicians are also in the race of courting favours from the influential ones. The wisdom behind the party-based model of Union Parishad elections is thus being questioned. According to the liberal school of thought, it has opened up an opportunity for the local people to be mindful about selecting their local leaders as well as engaging in the development process at the grassroots level. Such a party-based local government election enables elected representatives to get the maximum benefit from the political government. The central political party in power implements its agenda at the local level with maximum backing of UP elected representatives. Past observations of LG in Bangladesh show that the successive governments had to establish some kind of local government structure in order to mobilise support from the rural communities in their favour by providing welfare measures. Hence, LG could not successfully provide opportunities for the people, irrespective of party affiliation, to participate in the development activities. In general, the right to the security of one person is associated with liberty and includes the right, if one is imprisoned unlawfully, to the remedy of habeas corpus. Security of the person can also be seen as an expansion of rights based on prohibitions of torture and cruel and unusual punishment. The formal justice system in Bangladesh is under tremendous pressure with much workload and inadequate number of officials and staff members to dispose the cases. As a result, the case backlogs add up to the existing pending cases and at present it stands at about half a million cases. Village court under the Union Parishad, the lowest tier of the local government in Bangladesh, has been the alternative and reachable podium for the justice seeker in rural Bangladesh. The Village Courts Act of 2006, which replaced and updated the Village Courts Act of 1976, provides for the establishment of a village court in every Union Parishad. A related criticism of the village court is that it has little appreciation of rule of law and serves as an enforcer of often retrogressive norms. Bangladesh is a disaster-prone country and disaster vulnerability possesses a threat to human security. Human security is at risk as disaster renders the community without food or shelter, impoverished, diseased, and displaced. It is apparent that the national disaster management institutional structure recognises the importance of the institutional presence up to the local level for comprehensive disaster management. Union Parishad Disaster Management Committee, an ideal platform at the heart of community people, has underperformed on account of incompetence of local elected representatives. In the context of rural Bangladesh, environmental degradation is a particular case of consumption or production externalities reflected by divergence between private and social costs (or benefits). Union Parishad over the years has been confronted with numerous problems, which upshots poor management of environmental security in rural Bangladesh. The government of Bangladesh is striving hard to ensure access of its rural population to basic health care and health services by the way of setting up primary health care centre. Role of NGOs, particularly BRAC, in promoting primary health services for mother and children is notable. One of its responsibilities involves providing health security to the rural population, which is a challenging task given that only 30 per cent of Bangladeshis live in cities and there is limited infrastructure and a lack of health professionals in rural areas. Food security situation in rural Bangladesh over the years has somewhat improved and further improvements on access and utilisation, to be sustainable and large-scale, needs renewed efforts from the government, civil society organisations and the development partners. Issues of governance and accountability further thwart attempts to provide targeted safety nets and price stabilisation. Community policing is an aiding vehicle that complements human security by the way of building peace and ensuring safety and stability in the rural society of Bangladesh. It is a collaborative effort between the police and the community that identifies problems of crime and disorder and involves all elements of the community in search for solutions to these problems. Most communities, particularly those located in rural areas, still have reservations about working with a police resulting in decreasing the community policing. 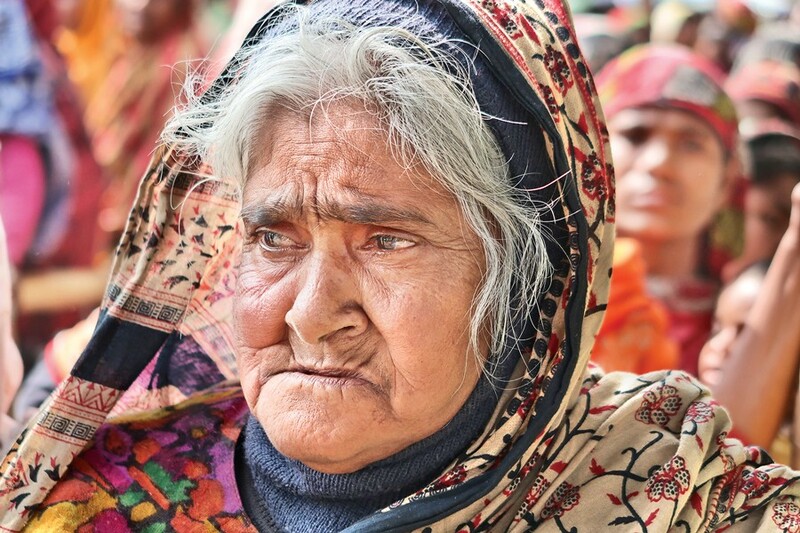 In truth, Union Parishad is supposed to play a significant role in ensuring human security for the people living in rural Bangladesh, but corruption, poor governance and lack of accountability are the common scenario in social safety net programmes like Vulnerable Group Development (VGD), Vulnerable Group Feeding (VGF), Old-age Allowance, Widow Allowance, and Disability Allowance. Let the local community lead and master the social changes. While NGOs are still likely to be most concerned with the essentials of improving human development, becoming involved in human security initiatives helps to strengthen them as organisations and to reinforce and extend the contribution that they are able to make to the people with whom they already work. Furthermore, to make the development truly meaningful, involving people directly in the formulation and implementation of decisions has been the demand of the hour. This necessitates the decentralisation of democracy to the lowest level. Let political parties and relevant stakeholders including community people take the lessons from the problems and overcome them for the greater interest of the nation. What we perceive at last, there is a need for paradigm shift in government side, from imposing development to facilitating rural development, from teaching the local people, to learning together with them. Mainstreaming human security to the existing rural development approach is a must. The writer is an Assistant Professor in Government and Politics, Jahangirnagar University and Visiting Fellow, University of Oxford.